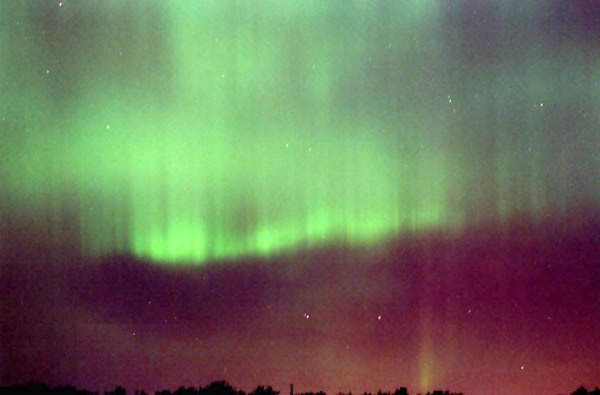 Perseid Meteor Shower and Aurora of August 11/12, 2000 (Astrophotos from the University Lowbrow Astronomers). 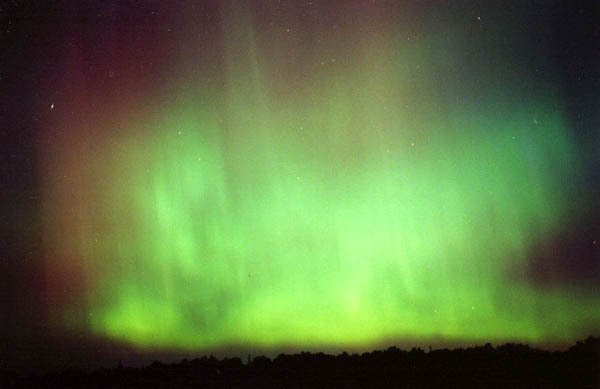 The Perseid Meteor Shower and Aurora of August 11/12, 2000. Based on a rough estimate of the limiting magnitude and published information on the Perseids, if the moon had not been present these numbers would have been higher by a factor of about 2.2. However that wasn’t all, those of us who stuck it out until the early morning were presented with an excellent aurora display. I’ve seen aurorae before, but never as dynamic as this one was. We first saw some lights in the early evening. However around 2:30AM, it intensified. By 3:30AM we saw pale green lights along the horizon that climbed into the sky, at times covering 3/4 the sky. The amazing thing was how dynamic it was. Most of the time at least part of the aurora was pulsing (I’m guessing here) about 6 times a second. There were ripples and/or curtains whose shape constantly changed. A few times we saw more intense green lights or red lights. This continued for an hour (until about 4:30AM) at which time it became much less active. One comment made at the time was “no one will believe this.” Unfortunately none of us had a camera so we didn’t take any photographs. (And no picture could capture the dynamic quality of the event). However we were not the only people to observe these events (they were seen across much of the United States as far south as 37 degrees North latitude and throughout Canada). Other observers did take photographs of this event, including Dennis Bartes who took the pictures shown above. There were reports of observers seeing about 90 meteors per hour on the evening of August 11/12. These were at very dark sites. This seems about right to me: having a site 0.75 magnitude darker than we had and assuming everyone is observing in comparable manner, the darker site should have a larger rate (larger by a factor of 1.8 which would account for the difference and seems quite plausible). In addition, there was a report of a Geomagnetic Storm which would have caused an aurora during the period 2AM-5AM August 12 (exactly the time we observed the aurora). The storm was listed as G3 (on the NOAA scale of Geomagnetic disturbances). Based on information from http://www.sec.noaa.gov/NOAAscales, this was not the strongest event that could occur nor was it that rare. Geomagnetic storms are listed as on a scale that goes from G1 (the weakest) to G5 (the strongest). There are on average 200 G3 events per solar cycle (with each cycle lasting 11 years). This contrasts with 100 G4 events and four G5 events per solar cycle. The immediate question is: None of us had seen anything quite like that display. Was this event really that unusual? I don’t know the answer. However there are several things to keep in mind. Just because there are 200 events doesn’t mean an observer will see 200 aurora. About half of these events will occur during daytime for any specific location and thus cannot be observed. You also need to reduce the number again to take into account cloudy weather and the fact that few people will spend the entire night watching the sky EVERY evening. So most of us will miss many of these 200 events. With a little investigation I found there are occasional aurora which have (as Terrence Dickinson and Alan Dyer describe it) “patches of light pulsing on and off over the sky,” which seems an apt description of what we observed. I suspect that many details may go into determining why one specific event appears as a static aurora and another appears as a dynamic aurora. For one thing, I suspect the fact that we were very dark adapted because we had spent several hours watching for meteors may have had something to do with it. Every other time I’ve seen aurora, I had NOT been that dark adapted. Also I suspect a stronger aurora will not necessarily appear more dynamic. More light may simply drown out some of the subtle pulsing effects that otherwise might be observed. And there may be physical factors that go into it as well. Photographs by Dennis Bartes. Dennis used an Olympus OM 2000 camera with a 24mm wide angle lens and Fuji Superior 400 film. Each photograph was exposed for 5-10 seconds. They were taken between 3:30 and 4:30am from his home in Heartland on the morning of August 12, 2000. These photos were contrast enhanced using Adobe Photoshop (however the colors have not been altered). 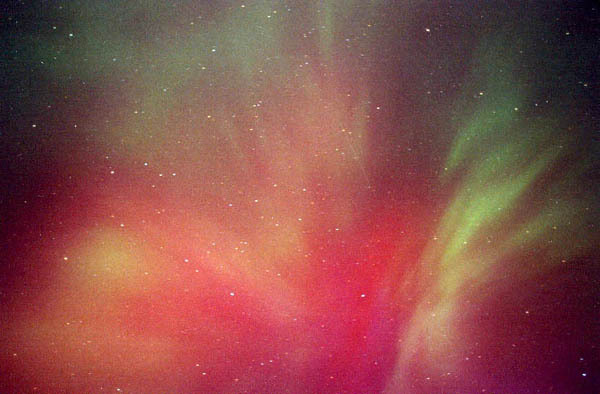 For more information on Aurorae, see the Space Weather site (http://www.spaceweather.com/). Wow!! by Bernard Friberg, August 2000 (another description of the Perseid Meteor Shower and Aurora of August 11/12, 2000). The list of all aurora photos from the Lowbrows.